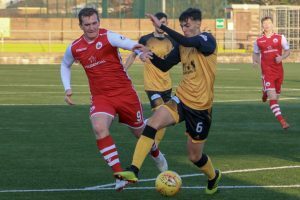 Annan Athletic had to be content with a share of the points in a match where Stirling Albion twice came from behind to earn a well earned point, a game that Annan may look on back and think they could have won with a little more application. It was however excellent entertainment for the crowd of 399 on a bitterly cold afternoon with the game in the balance right up to the final whistle. Annan boss Peter Murphy was forced to make changes from the team which was defeated the previous week against Cowdenbeath with Alex Mitchell taking over in goal from the injured Jonny Jamieson and James Creaney being given the left back role in place of the injured Lewis Strapp. It was a welcome return to Galabank for Kevin Rutkiewicz who has gradually turned the fortunes of Stirling around since his departure from Galabank five weeks ago. Annan started the match on the attack and for the opening spell put the visitors on the back foot and Owen Moxon was very unlucky to be denied by the post in the 15th minute when his well struck shot form 20 yards beat keeper Cameron Binnie but the effort cannoned off the outside of the post. Chris Johnston looked in menacing form all afternoon and the tricky winger was at the heart of Annan’s opening goal in the 21st minute after he won a free kick on the bye line and his pin point cross from the free kick found Tony Wallace powering in to head the ball into the net from close range. Annan continued to press forward without managing to seriously test Binnie in the Stirling goal. The visitors like wise failed to penetrate the resolute Annan defence. The second half saw Albion make a couple of changes to their defence with Darren Barr and Evan Horne being replaced with Kyle Banner and Ronan Hughes in an effort to thwart Annan’s attack . The quality of the football in the second period turned out to be more entertaining for the supporters with both teams determined to win the match with both teams going for the victory. After a good period of pressure Stirling Albion squared the game in the 56th minute, after the Annan defence failed to clear their lines and the ball was cut back to Dylan Makin who’s low shot from 14 yards found the corner of the net past the outstretched arms of Alex Mitchell . Annan almost responded immediately when Johnston once again cut the ball back to Moxon who’s shot went narrowly past the post. Annan looked the team most likely to break the deadlock and when Moxon volleyed Johnston’s cross from the edge of the box over the bar in the 70th minute there was an air of expectancy that Annan would get the breakthrough and in the 76th minute it arrived. The goal was created down the right and ended with Ryan Sinnamon cutting into the box and finishing with a well struck low shot from 16 yards which flew into the net past the outstretched arm of the diving Cameron Binnie. Annan had the edge at this stage but their lead lasted just six minutes when Dominic Docherty scored another high quality goal, his well struck shot from the edge of the box sailed into the top left hand corner of the net past the outstretched arms of Mitchell. With 15 minutes left Annan continued to press forward on the lookout for the vital goal and the Stirling defence had to withstand an anxious end to the game. In the dying minutes Annan were awarded a free kick 25 yards out, Sinnamon’s effort was deflected for a corner and from the resulting corner Cameron Binnie pulled off an absolutely stunning save from Ross Ferguson’s net bound header. Annan Athletic – Alex Mitchell, Scott Hooper, James Creaney , David Wilson, Owen Moxon, Kyle Bradley Chris Johnston ( Scott Roberts 89 min), Ryan Sinnamon, Max Wright, Tommy Muir ( Ross Ferguson 69 min), Tony Wallace ( Aidan Smith 75 min ). Subs not used Ruaridh Langan, Peter Watson , Ayrton Sonkur. Stirling Albion – Cameron Binnie, Ross McGeachie, Jordan Allan, Darren Barr (Kyle Banner ht), Evan Horne ( Ronan Hughes ht ), Jason Marr, Daniel Jardine, Dominic Docherty, Trialis (Darren Smith 77 min)t, Neil McLaughlin, Dylan Makin. In the other SPFL2 matches played Berwick won the basement battle against Albion Rovers with a 2 goal victory. Elgin City lost their home match going down 3-1 against Clyde. Cowdenbeath entertain Queens Park on Tuesday evening. Edinburgh City were involved in the Irn Bru Cup and they defeated Alloa Athletic in a penalty kick decider after City came back from 2 goals down to earn a draw before going into the penalty kick decider.